Learn economical ways to deal with production logistics. Chemicals play a key role in the upstream process. They provide flow assurance to keep wells pumping, and they also deliver scale and corrosion inhibitors that prevent costly equipment downtime. Despite the value of production chemicals, most operators have limited visibility into their chemical management programs. Most sites are inspected by chemical service technicians who drive to each location to check pumps and measure chemical tank volumes. Not only is this route-based approach expensive, it also fails to accurately monitor the rates at which chemicals are being injected. Research based on well site surveys suggests that 25 to 50 percent of injection rates fail to hit their target rates. As a result, operators waste chemicals through over-injection, or they miss their production goals due to scale and corrosion, or paraffin issues—all of which require increased maintenance and downtime. This same research shows how automating chemical management enables operators to reduce operating expense by $3,000 to $6,000 per chemical tank per year. Hardware – Intelligent edge devices wired to industrial sensors can monitor and control critical metrics for chemical management applications, including pump rate, tank levels and production rates. These devices possess the logic needed to make decisions and control operations locally, and they transmit data back to the cloud for additional analysis. Networks – IIoT networks designed for machine-to-machine communication, such as low power wide area (LPWA), enable assets once “stranded” in network dead zones to be reliably and cost-effectively monitored. 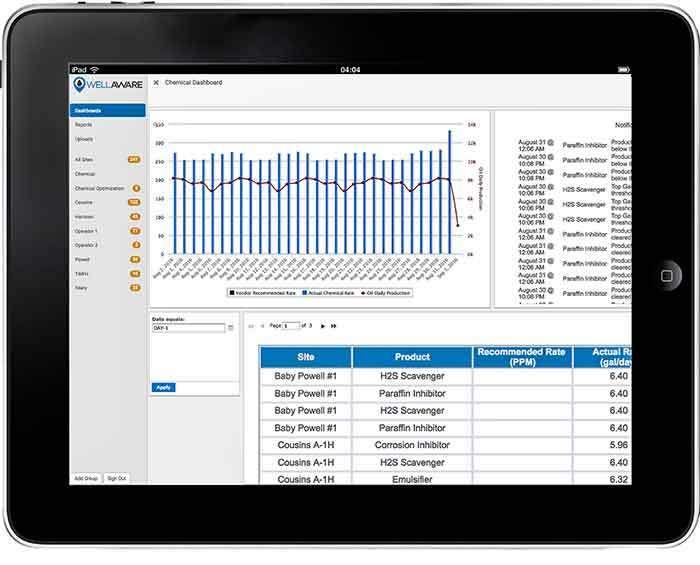 Software – Software as a service (SaaS) web applications and mobile apps provide reports and alarms that are easy to use, even when out in the field. These applications can visualize data that was once inaccessible behind a firewall, enabling operators to extend the value of their existing supervisory control and data acquisition (SCADA) systems. These technologies can be combined with the following best practices for improved operations. Collect pump rate and tank level data remotely though a data network—typically cellular, satellite or LPWA. For batch truck treatment, native mobile apps can collect treatment data, even when cellular coverage is not available at the location. Monitor alarms for anomalies such as high or low injection rates, low tank levels or power outages at well sites. These alarms can be delivered by SMS or email notification. Analyze data via dashboards and reports; dashboard apps provide an overview to identify which sites have issues that should be prioritized. Reports help drive decisions, based on historical data. Typical reports include chemical usage, pump rate accuracy and batch treatment reports. One size will never fit all, so operators should look for solutions with customized reports that can be tailored to their specific business processes. Many companies seeking to automate chemical management programs start with tank level monitoring systems (only). These systems, which screw directly into the tank, are typically battery powered. While they seem simple, many operators end up replacing them because they cannot measure injection rates accurately. Tank level sensors are accurate to approximately 10 percent, due mainly to the wide temperature swings in the field, inaccurate pump calibration methods and changes in product specific gravity. But pump rate monitoring and control systems measure pump strokes (or tach feedback in the case of variable speed pumps) to precisely determine pump injection rates. These systems can also remotely change pump speed, vary injection rates based on production flow meters or H2S analyzers, and start injections at particular temperatures to keep wells from freezing. These control systems should be certified with pump original equipment manufacturers (OEMs). They should also work with solar powered, direct current/alternating current (DC/AC) powered or pneumatic pump types. For a slight premium compared to tank level only systems, pump rate monitoring and control systems offer a quicker payback in almost every scenario. Target injection rates should be updated based on the current production of the well. If unadjusted, injection rates can become too high—particularly when well production declines—or too low if they are not adjusted after well stimulations. Far too often, adjustments to target rate calculations get overlooked, especially since many chemical service providers do not have well production levels on hand. This issue can be easily solved via software systems. Production levels from an operator’s SCADA system can be quickly imported with a .CSV file upload, or an FTP-file integration can be used to automate the process. With this information, a chemical target rate report can identify which wells should have pump rates adjusted to provide more effective treatment. Additionally, many operators want to have chemical injection rate data for historical analysis, so this information can be provided to the operators through standard integrations with SCADA systems and historians. Many pumps in the oil field are single-speed pumps that use a start/stop method of flow rate control. Their flow rates are determined by running the pumps for a set period of time and then turning them off for a set period of time. This approach essentially provides micro-batch treatments to the well, which is adequate for some applications. But for critical assets and pipeline operations, it is much more effective to use variable speed pumps. The value of variable speed pumps can be increased when deployed in closed-loop control applications, where a chemical flow meter is added to precisely measure the volume of chemical delivered. Image 2. Role-specific dashboards allow different users to see specific performance indicators at a glance. Image 3. Mobile apps provide reports and alarms that can be delivered via email or SMS. The oil field is a dynamic environment. Wells are often shut in, worked over and brought back online. Pumps require ongoing maintenance; tanks spring leaks; solar batteries die; and storms can shut down entire sites. Staying on top of change requires collaboration between operators and service providers, and chemical management solutions help by automating notifications and improving communications. The process of capturing site data, storing it in the cloud and sharing it via the web (or iOS/Android-based apps) keeps all stakeholders on the same page. Role-specific dashboards allow different users and business partners to see how systems are performing at a glance. Usage reports summarize information for injection treatments over desired date ranges, and they make it easy to identify any changes that need to be made. Alarms can be customized to notify both service providers and operators. Improving market conditions and a rebalancing of supply and demand are slowly starting to stabilize balance sheets for upstream operators, providing the capital needed for investments that can better prepare them for the long haul. Regardless of the price of oil, one thing that will never change is the need to continually increase efficiency. David Milam is the chief product officer at WellAware, where he is responsible for driving product strategy, roadmap and marketing. He may be reached at davemilam@wellaware.us. For more information, visit wellaware.us.